Home » Belize Travel Blog » Tours From The Island » Caves and Waterfalls With Mystic River Resort and Not Just Any Caves – ATM! Caves and Waterfalls With Mystic River Resort and Not Just Any Caves – ATM! Last Sunday evening, I was throwing my usual things into my 1992 Laura Ashley duffle bag to head to Mystic River Resort. Travelling in Belize doesn’t take much…a pair of shorts or two…multiples changes of shirts, some flip-flops and bug spray, numerous bandanas for just about every reason and…voile. Ready to roll. But I was headed out to Cayo…the jungle. And I knew one of the most popular tours at Mystic River was the ATM Cave. THE ATM CAVE! Better throw in an old pair of sneakers. But…UGH…I was scared. One of the top 10 caves in the world. One of the most talked about tours in Belize (rivaled MAYBE by the Great Blue Hole). A sacrificial site that can only be reached with a 40 minute (flat) hike and then a mile hike/climb/swim underground to see the Crystal Maiden. I had been putting it off for years. I put it off until cameras were still allowed in the cave (read this 2012 article titled “ATM Cave Closed: Tourist Dropped Camera on Ancient Skull” and now there are rumors always circulating that this cave will be closed forever. When you go in, you will see why. It is absolutely amazing…you honestly CAN NOT BELIEVE you should be in there. Take a few steps…look down and there is a bone or a piece of pottery. I won’t go through all the details but here is what you need to know. 1. The first 5 minutes in the cave are the scariest because the rocks are slippery (light means algae) and you have no idea what to expect. During that time – you’ll think about earth quakes and floods and get over yourself. It gets awesome from there. 2. You are going to say “Are you SURE we should be doing this”at least 15 times. At least. 3. You will be hiking in SOCKS for some of the trip!!! 4. It’s amazing from a geological, historical and creepiological stand-point 5. There is no time for fumbling with a camera anyway…it would totally just be a nuisance (say I…who takes pictures of EVERYTHING and 6. You emerge feeling like WONDERWOMAN. Like you can do absolutely anything in the world. Picture above from a great blog post about the cave in 2012 with photos. It is insanely, completely, totally, once in a lifetime awesome. That I will TOTALLY do again. I know that people will ask me how “fit” one needs to be. Honestly, I think if you go with a small group – two to four is IDEAL – and listen to your guide….take his help whenever offered…there are no major strength or fitness moves needed. The rocks in the cave aren’t slippery but your ankles, knees and hands and muscles that you haven’t used for a while will get a work out. Trying to stabilize you. Young adults, teenagers would love this. I absolutely loved it too. And I’m pretty proud of my chicken -little -self for doing it. Thank you Mystic River for giving me the shove! And the ONLY picture I have of the entire trip is my lunch afterwards…I was insanely hungry. 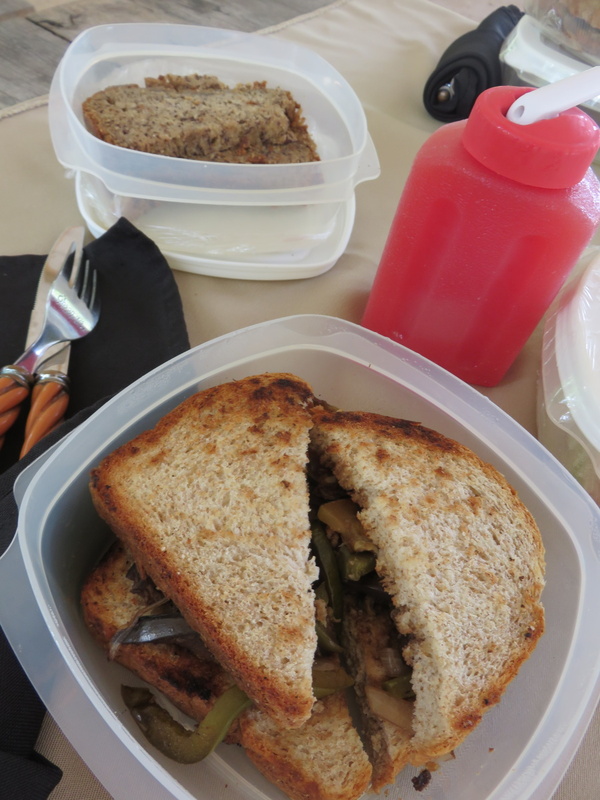 And watermelon juice…the fresh baked bread and grilled veggie sandwich, the fruit and the best banana bread I’ve ever eaten was perfect. A picnic lunch complete with table cloth and real silverware! Day Two on my Cayo adventure, I woke up a bit ATM-sore…but was off on my next trek. One that only Mystic River Resort does. They in fact, cleared many of the trails and built hiking walkways to make it all accessible. 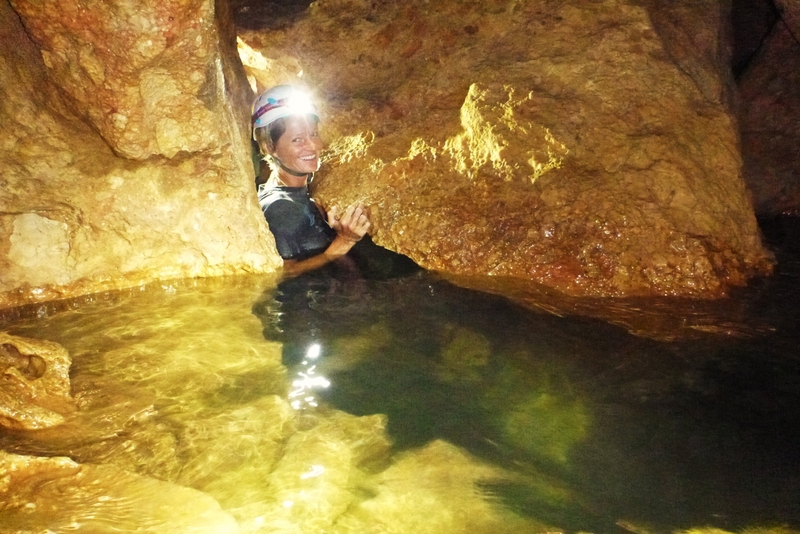 Sapodilla Cave and Blancaneaux Waterfalls…and I have one million pictures of this full day Polaris adventure. 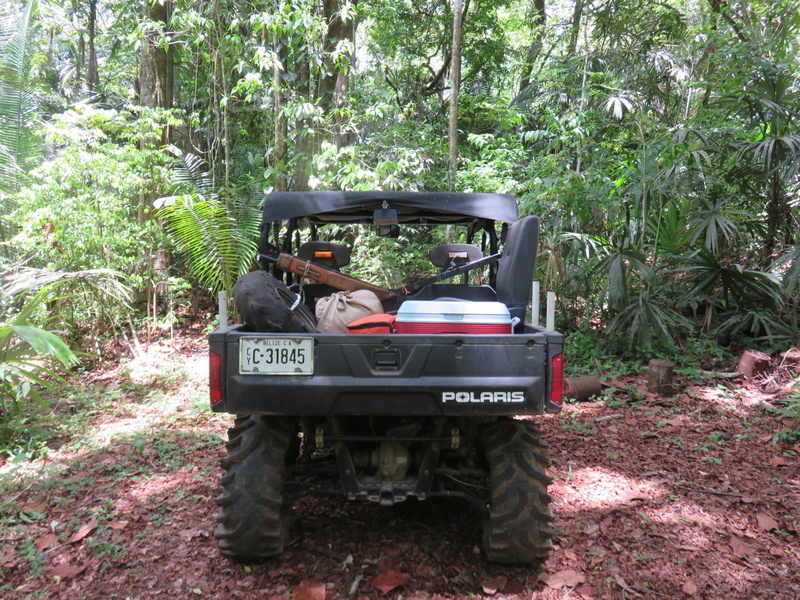 We set out early with coolers and machetes (as one does in these parts) – and drove across peanut fields and pine forests, through rivers and up steep inclines but…I’ll get into all of that tomorrow. Now I am off to the West Side of Ambergris Caye…and one of the glorious sand bars. From jungle adventure to crystal clear Caribbean in a matter of hours. Belize kinda rocks. SO glad you finally got to do ATM! We went in 2012 when cameras were still allowed, and I have to beg to differ — we took our waterproof Pentax, and taking many quick photos was not a problem at all. We got some excellent ones, and some not so good, but no matter what, it was an experience we’ll never forget and one of the highlights of our time in Belize. Our guides were archaeologists, so the entire day was incredibly educational. The hardest part to me was jumping into the freezing cold water at the start and swimming into the cave. Brrrrrr! But after that, it was all fun and exciting. I wasn’t even scared, and I am a total wimp. I just loved this experience and recommend it to anyone moderately fit. Hi! Wow, I love your blog! We are going to Belize in a month and only have 2 full days on the mainland, I am thinking Lamanai and the ATM cave, but I am struggling with that or zip line/cave tubing. I also want time to wander… Any thoughts on how you’d recommend prioritizing? Do you have a guide/guide service onsite that you recommend for touring ATM? We will have a car and can drive there ourselves.